Halloween seems like a suitable occasion to share my progress on perhaps the most terrifying of the Dreadfleet ships, The Bloody Reaver. This model just exudes horror movie archetypes with its Gothic keep and skull-faced cave mouth. I had hoped to have the ship finished by now but it is such a detailed kit I didn’t want to rush it. As you can see there is a lot of work to do including the ship wrecks, dragon statues/figureheads and sails. At the moment the model still hasn’t been fully assembled (I just snapped the pieces together for the photo but they haven’t been glued in place yet) which is why there is a gap on the path to the castle. This will need filling once everything is assembled. Hopefully I will have more time to work on it during the week. 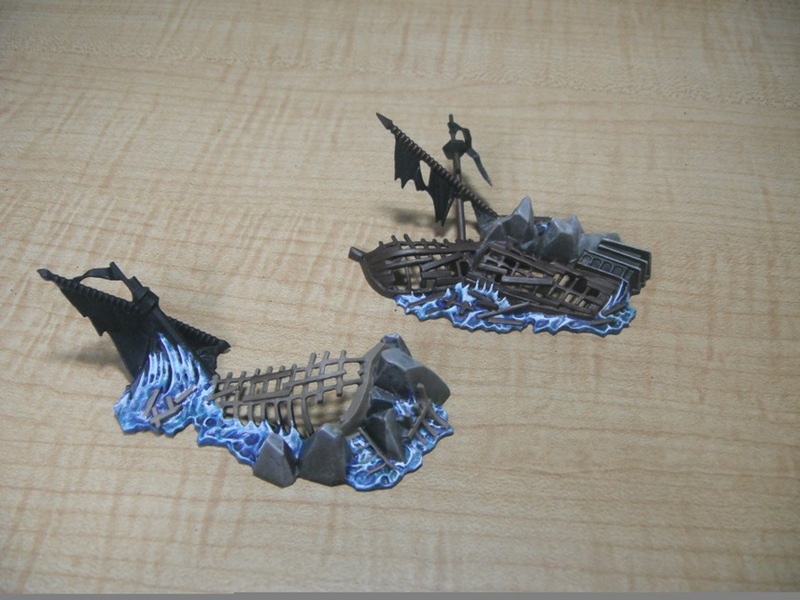 As I mentioned in a previous post, one of the really impressive things about Dreadfleet is the way in which each of the gaming pieces is a model in itself. The turning wheel and wind gauge/vortex marker could so easily have been produced as cardboard templates but instead GW went the extra mile and created them as molded plastic pieces. These little models are great fun to paint. The wheel on the right is done and the vortex marker is almost complete; I just need to finish the clouds/air symbols around the side. 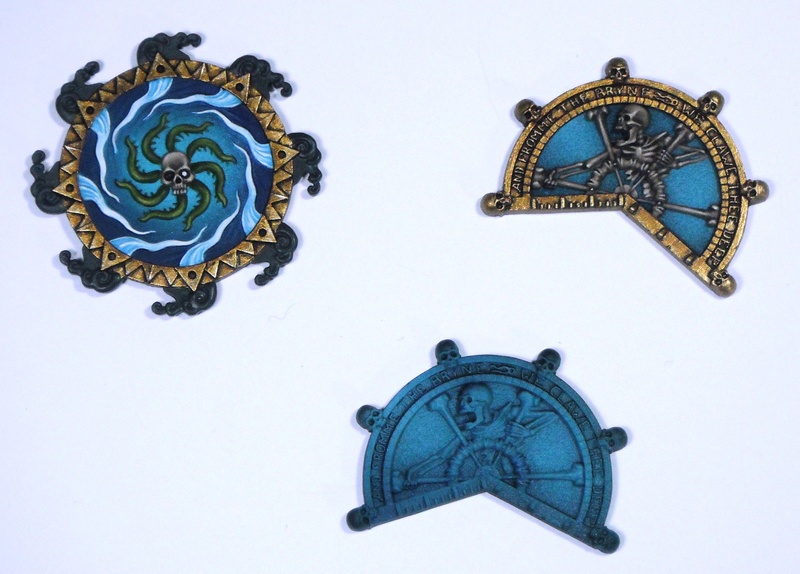 The turning wheel was airbrushed Regal Blue followed by Hawk Turquoise and then Hawk Turquoise and Skull White (as can be seen on the other wheel in the first picture). The gold was painted with a 50/50 mix of Vallejo Brass and Scorched Brown followed by pure Vallejo Brass. This was then washed with Vallejo Black Brown (although a thinned mix of Scorched Brown and Chaos Black would also work). I then worked up the gold through Citadel’s Shining Gold, Burnished Gold and a Burnished Gold and Mithril Silver mix. This was then given a final highlight of pure Mithril Silver. I then basecoated the bone with Khemri Brown. This was washed with Vallejo Black Brown and, when this had dried, Leviathan Purple was applied to the recesses. I reapplied the Khemri Brown in all but the shaded areas and proceeded to highlight the skeleton by adding increasing amounts of Bleached Bone to the Khemri Brown. A final highlight of Skull White was used to pick out the very edges of the skeleton’s features. Although this time I painted the gold areas before moving on to the bone areas I would probably paint the bone first next time and add the gold border after as it is impossible to avoid handling this piece while painting it and I ended up getting some flakes of metallic paint on the skeleton which was a pain to correct. 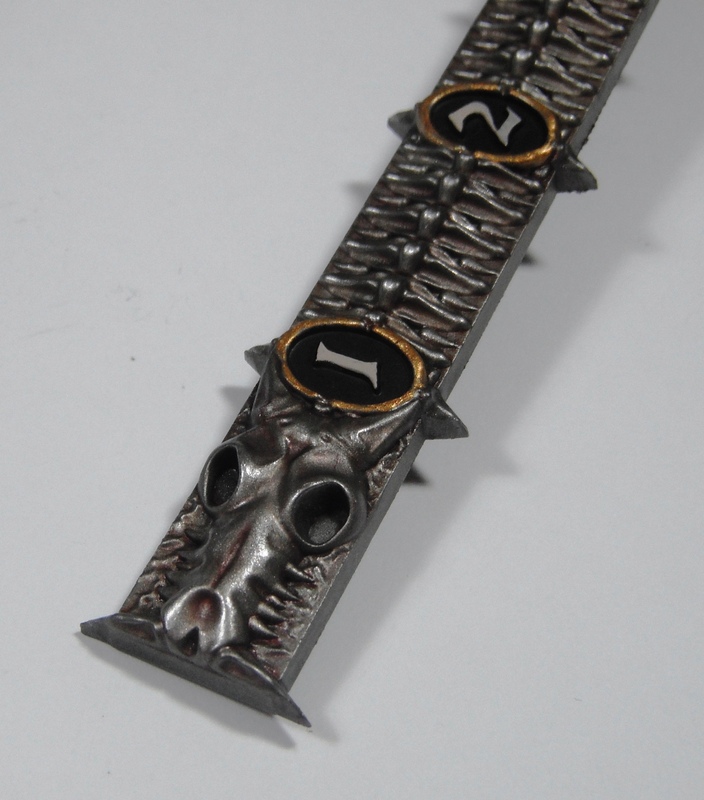 Even the ruler in Dreadfleet is a model. 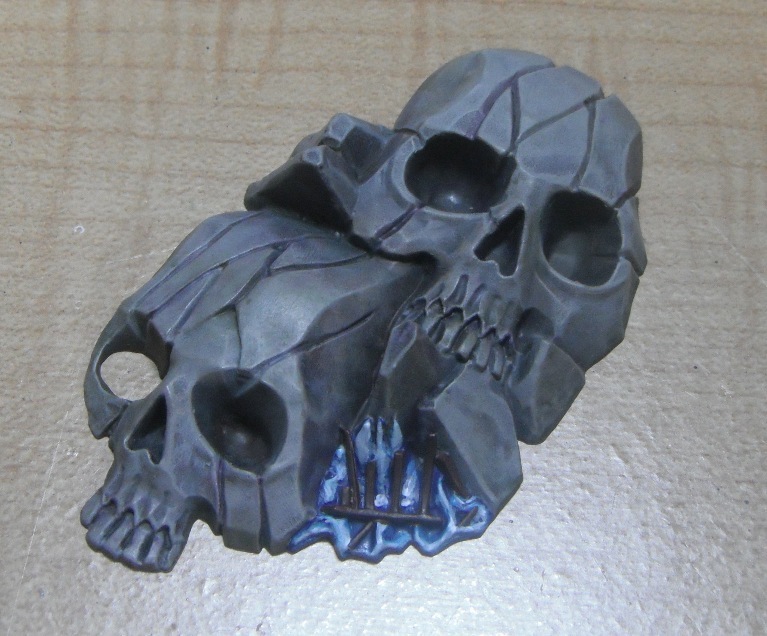 I decided to shy away from painting this bone as I have seen many others do in favour of painting it silver. This was mainly because my technique for painting bone is quite time consuming as well as simply wanting to do something different. Keeping the three components separate, I airbrushed the ruler Boltgun Metal. When this had dried I applied successive washes of Gryphonne Sepia, Ogryn Flesh and Devlan Mud (waiting for each wash to dry completely before applying the next one). This was then highlighted Boltgun Metal followed by Mithril Silver. The numbers were painted Chaos Black and Dheneb Stone and framed with Vallejo Brass. It is important when painting to mask the hinges on the model with blue tack first so that the paint doesn’t prevent them from fitting together and moving once the whole thing is finished. One of the really cool things about the ruler is how it is not only used to measure distance in the game but angles too. It pivots to 45 degrees. 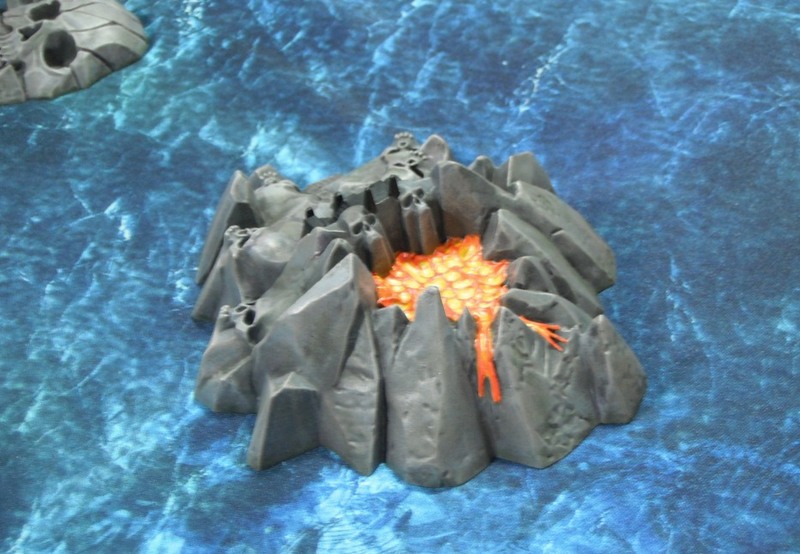 I have also repainted the lava on Volcano Island (how do they come up with these names?) since my last post. 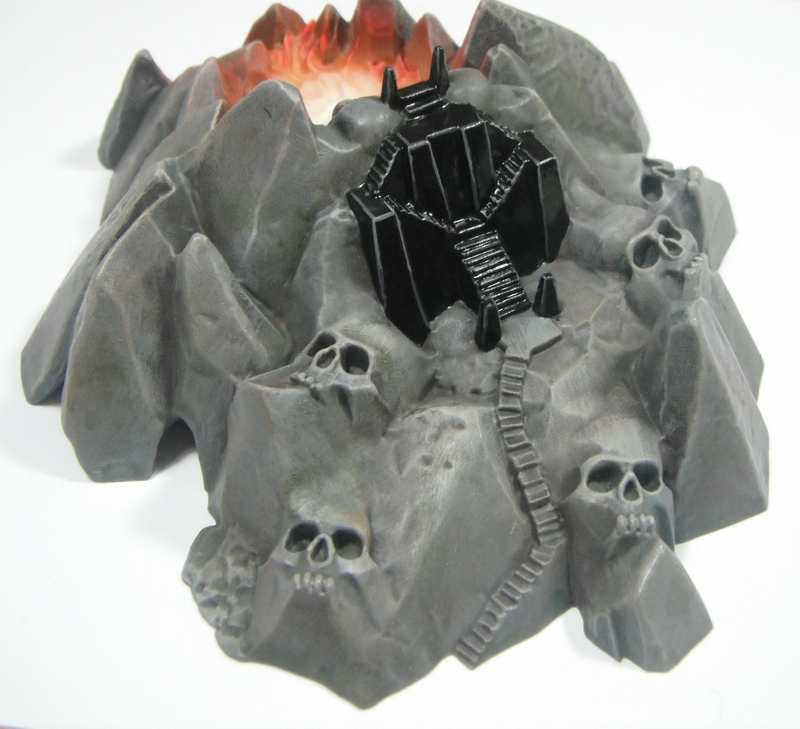 The lava was basecoated Red Gore and airbrushed using Blood Red, Blazing Orange, Bad Moon Yellow and Skull White in that order to achieve a glowing effect. This was then touched up using the old Citadel Yellow and Orange Inks (although I am sure that any other inks would do). Overall I am much more happy with its appearance now. I wanted to paint the temple on the other side of the volcano as obsidian to look like it had been built out of volcanic rock. To achieve this the temple was painted Chaos Black and edge highlighted using Adeptus Battle Grey followed by Codex Grey. It was then finished off with a coat of gloss varnish in order to give it a nice shiny appearance. I had previously used the same technique to paint the standing stone circle atop Corpseface Cliff. This lends a nice visual unity to the pieces. 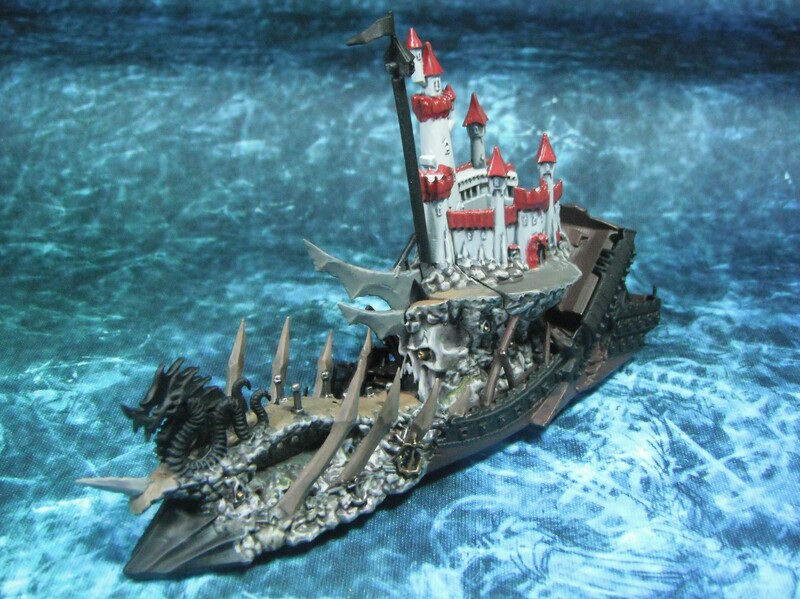 Before I leave you I thought I’d share two interesting Dreadfleet features I have discovered online. 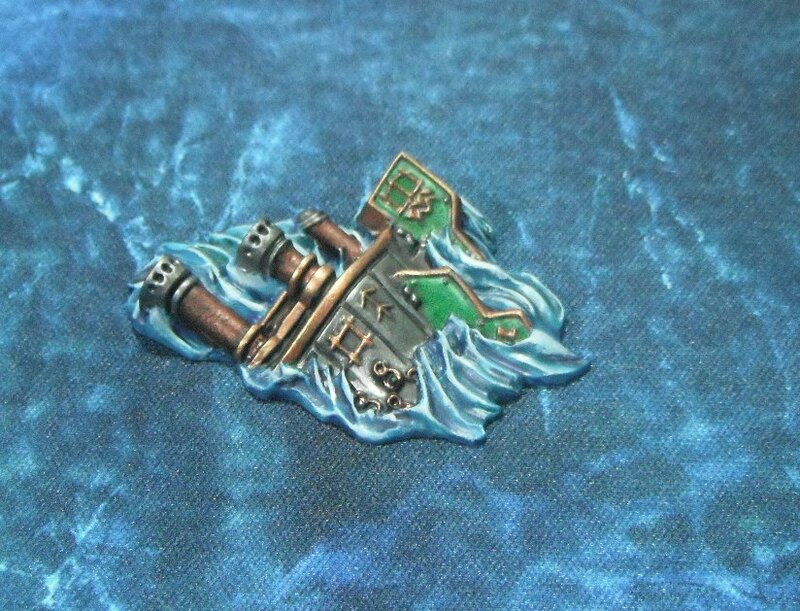 The first of these is a post by ‘The Irishman’ entitled ‘Why Dreadfleet Matters’. This is an interesting and well thought out piece which I totally agree with and is well worth a read. It can be found here. The second is Dave Taylor‘s post about ‘Celebrity Dreadfleet’ which you can read about over on Dave’s blog here. If you haven’t read Dave’s blog already than I would heartily recommend it. Not only is Dave a talented modeller and painter who’s blog provides a great deal of inspiration and advice but he is also regularly involved in charity events such as the Storm Wardens project and more recently Heroes of Armageddon. 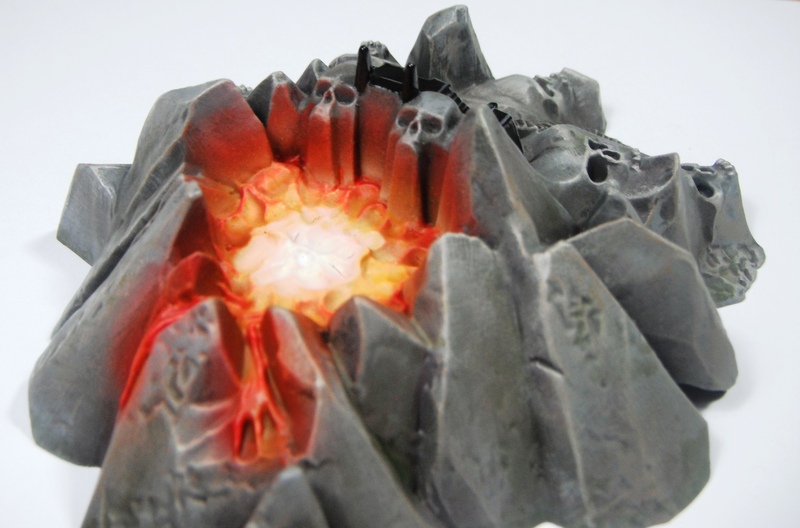 These projects are essentially about raising money for worthy causes through hobbying. The latest of the noble endeavors with which he is associated is Celebrity Dreadfleet which you can read all about here. Anyway, that’s all for now. 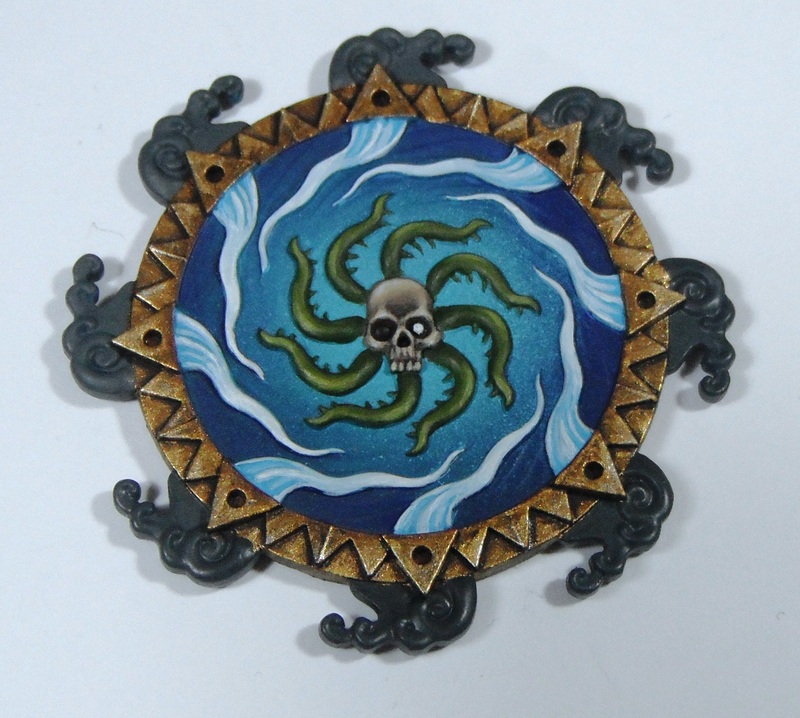 Hopefully more Dreadfleet to follow in the next few days. I’m not entirely happy with the volcano. I may yet go back and repaint the lava. I must say that on receiving my copy of Games Workshop’s latest limited edition release, Dreadfleet I really was impressed. The box is much larger and weightier than I expected and made of a thick, durable cardboard. There was even a thin sheet of card separating the plastic sprues from the rulebook and cards ensuring that they do not get scratched. 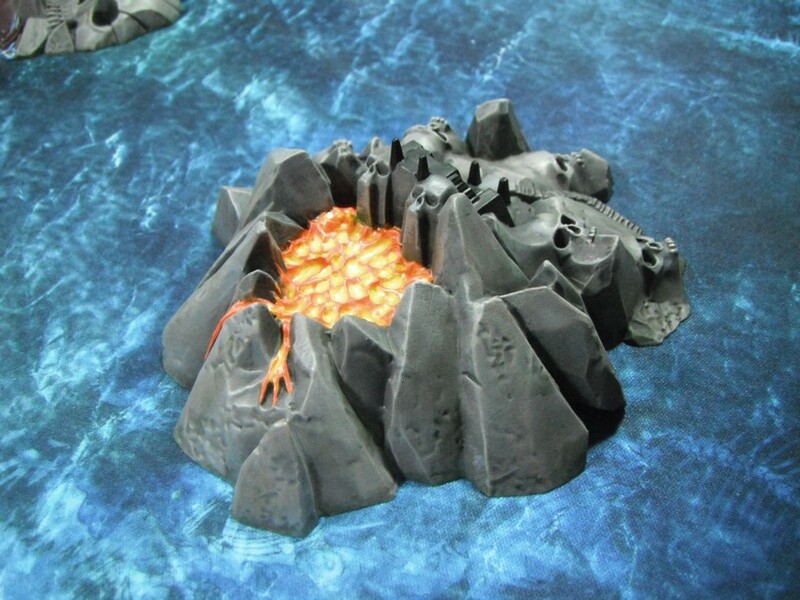 The deep box really is filled with plastic and a lot of thought has clearly gone into the layout of the sprues which are absolutely packed with ships, islands, monsters and all manner of gaming accessories. One thing I really like about the set is the fact that, with the obvious exception of the cards and dice, all of the gaming counters/pieces required for the game are models in themselves. It’s little details like this that really make the game stand out. The detail on the models is very crisp and there are very few mold lines to remove. 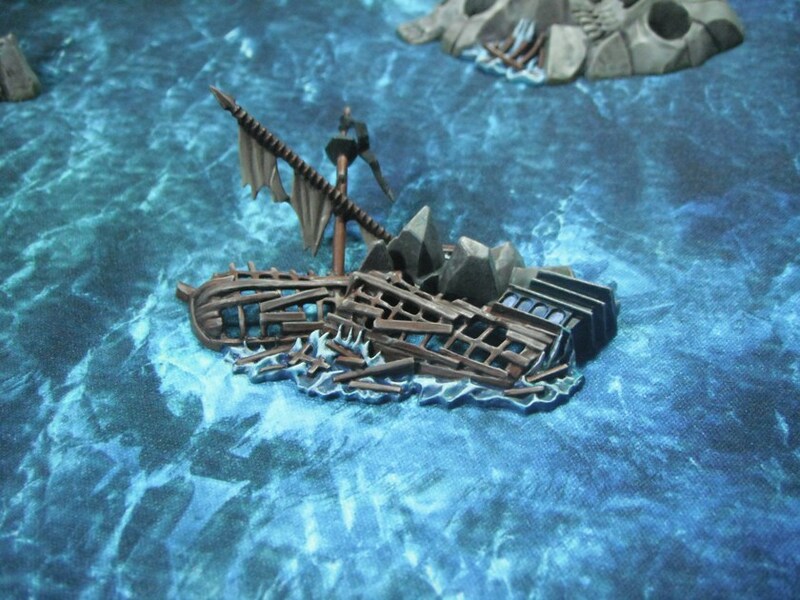 The designers have also made good use of ‘negative space’ on the shipwrecks and models such as the Shadewraith. 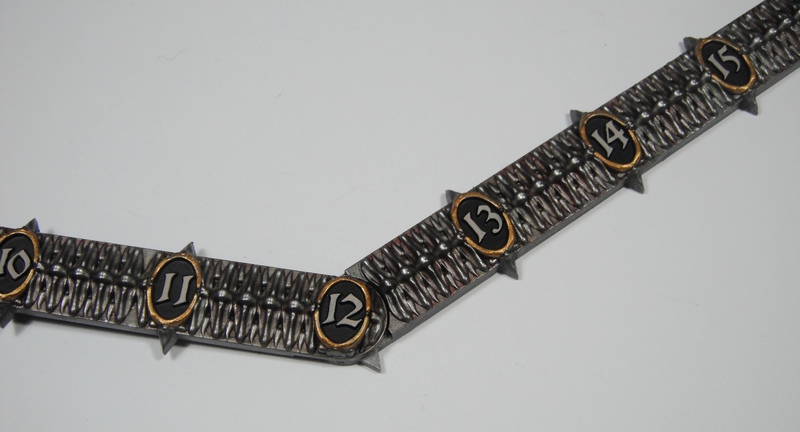 I only have a few complaints about the set and these are very minor indeed, hardly worth noting at all. 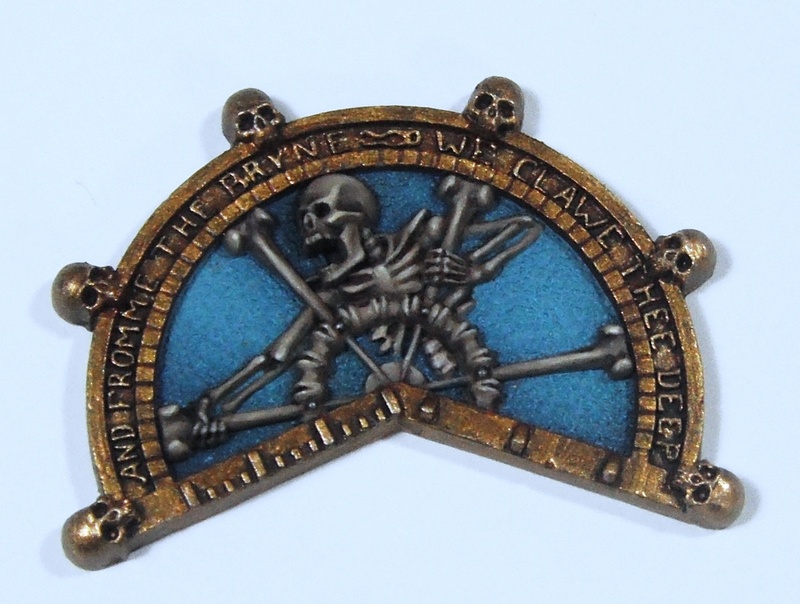 Firstly, the giant skulls are a bit silly but skulls are increasingly becoming a part of the Warhammer aesthetic (so much so in fact that one GW blog post on Dreadfleet reads: “Like all things Dreadfleet, it is, of course, liberally covered in skulls” -29.09.11). I guess it’s just a matter of personal taste. Also, there is only one design of cog for each fleet which is odd considering the amount of detail that has gone into the rest of the design. However, again this is only a very minor complaint, just nitpicking really. Since its release the internet has been awash with comments and reviews about Dreadfleet, some good, and some bad. However, I for one am certainly very happy with my purchase. Although I have not yet played a game,I am incredibly satisfied with the models which is the primary reason why I bought the game. When it came to painting the set, I decided to start with the terrain and various gubbins that come in the box as these will be needed for every scenario. 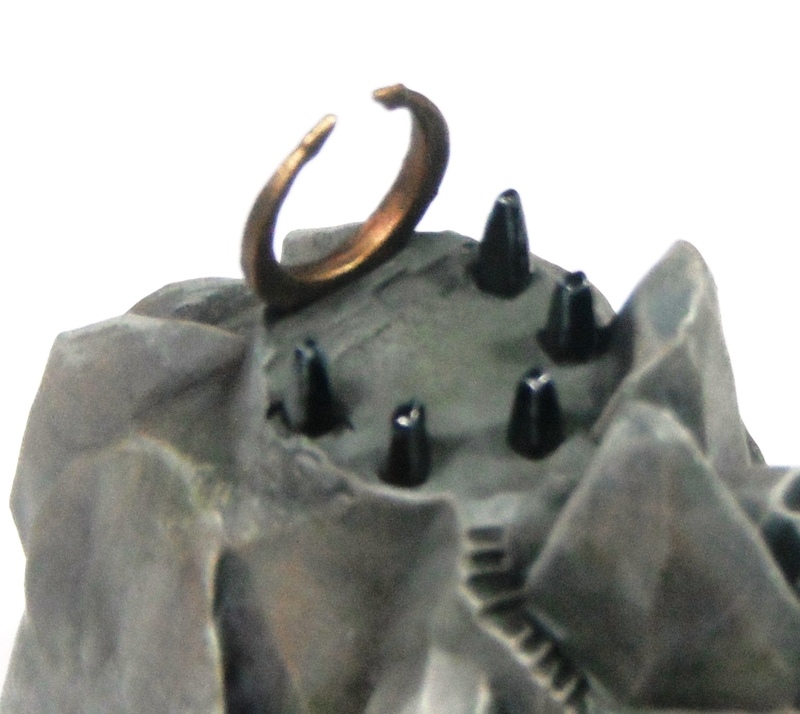 So far work has commenced on the islands and shipwreck pieces, all of which are in various stages of painting. For these I started with a coat of Charadon Granite followed by a heavy drybrush of Charadon Granite and Codex Grey and then pure Codex Grey. This looked a little too grey and so I followed this with a slightly more patchy drybrush of Khemri Brown. This was followed with Fortress Grey, a Fortress Grey and Bleached Bone mix and finally Bleached Bone on its own. For each drybrush I used less and less paint until I was only catching the fine details of the model. Watered-down Catachan Green was then applied to add some more variety, concentrating on the bottom of each piece where the tide would result in the rocks becoming very green and slimy. 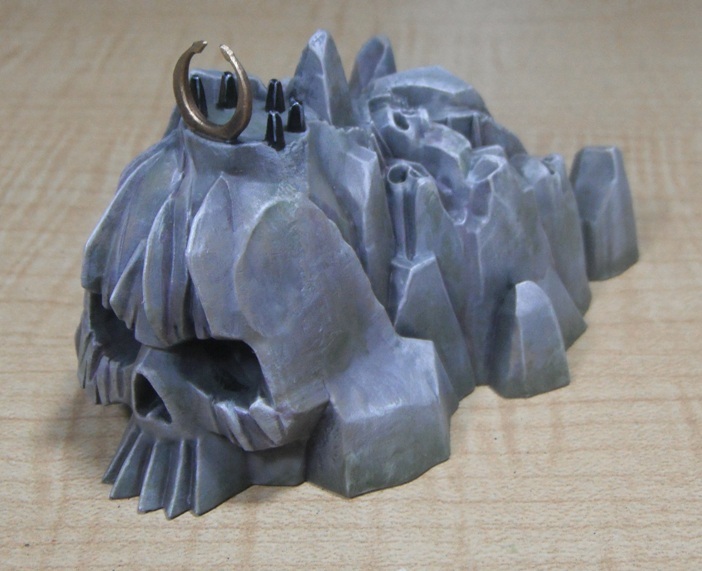 Leviathan Purple (a very appropriately named colour for this project) was then painted into the recesses to add depth and variation to the shadows and to mimic the slightly purplish hue that rocks have in real life. The water was painted Regal Blue to provide a nice dark base to work from. This was then layered with Hawk Turquoise leaving only the recesses uncovered and highlighted by adding increasing amounts of Skull White to Hawk Turquoise. The water was then randomly washed with Asurmen Blue and Thrakka Green to provide additional variation. The white spray on the crest of the waves was stippled Atronomican Grey followed by Skull White. More to follow soon. Have a good week.